It has been a long time since cotton was king in Oconee County. For a number of years now, farming as we knew it, is �Gone With the Wind�. Later generations have sold farms for land prices that our ancestors would not have imagined to be possible. The Dawson Homeplace was owned by my Great-Grandfather Young Henderson Daniell, who died in 1905. My Grandmother, Hassie Daniell Dawson (Mama Hassie) grew up there and so did my Dad, Rayford T. Dawson, and his siblings, and later my generation. My grandfather, Cliff Dawson, and my father, Rayford Dawson, died in the home house. 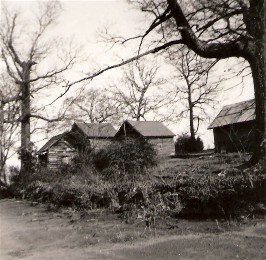 Old Cotton Houses at Dawson Homeplace –Picture Taken in 1954- The small log house to left was where meat was cured. The next one was the high cotton house and the one to right of it was Poison House and the last on the right was the Long Cotton House. My memory has many ‘files’ of activities on these grounds. Recently, my wife found an old 1954 photo of the “Cotton Houses” located in front of the house and adjacent to what is now Cliff Dawson Road. I have many memories of the “Cotton Houses”- unloading wheat, corn, cotton, fertilizer, poison for cotton, meat in salt boxes etc. In the “meat house” were wooden boxes filled with salt (approximately 4 X 4 X 4 feet) in which fresh pork hams and shoulders were ‘cured’ and stored. Later the meat would be hung in the old Smokehouse behind the homehouse. The little log house that was the meat curing house also had a large wooden box (approximately 8 X12 X 6 feet deep). Fresh harvested wheat was stored in this box and from time to time, bags of it would be taken to Snow’s Mill or elsewhere to be ground into flour for food for the family. The “High Cotton House” was used to store cotton after it was picked until it was ready to be ginned. 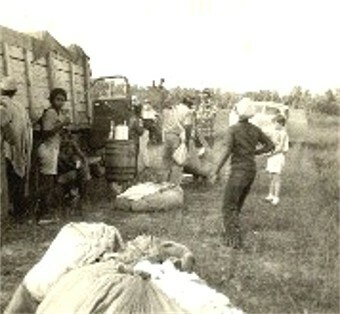 Later, large cotton wagons changed this operation and cotton was emptied from sheets after picking into the wagons for the trip to the cotton gin- at Watkinsville or Walt Jones Gin in Statham. During the fifties, harvested wheat and sometimes oats were stored in this building which had material around the sides to prevent leaks and to keep out rodents. The old tenant house where I lived until I was about 14 was also used for grain storage for the Federal Crop Program. Mr. John Clovis Saxon would come around to “measure” the grain and insure that USDA had security for its crop loan program. The “Poison House” was used to store bags of poison for the cotton fields.At one time, a mixture of arsenic and molassess was used to “mop the cotton” to kill boll weevils. The poison house was avoided except to load and unload poison. In later years, scientific advancement allowed for a less intrusive system of controlling boll weevils – genetic engineering I believe has been used to reduce the population. The boll weevil was a real threat to cotton farmers until about the 70’s and 80’s. They could bore into unopened cotton bolls and destroy it before it bloomed into cotton. It could drastically reduce the crop production and farmers would take drastic steps to fight the boll weevil. The “boll weevil depression” of the 1920’s was a disaster. It caused many farmers to lose their farms. In running real estate titles, one could see a lot of farms owned by Insurance Companies (John Hancock was one) and by the Federal Land Bank. This economic loss preceded the Great Depression and probably made it much worse for rural Georgians. The Long Cotton House was used to store cotton waiting for the trip to the gin. It was also used to store corn and one end was where fertilizer was stored. 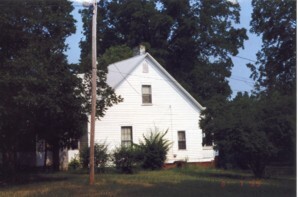 In my adolescence, I remember “shucking corn” and other chores in this house. In my mind’s eye, I can remember visions and dreams of going to the Athens Area Agricultural Fair in the Fall. Daddy would let us have the money from ‘picking scrap cotton” to spend at the Fair. In the agricultural south, especially before TV and better transportation, the Fair or Carnival was a real annual treat and most of us had that experience on an annual basis. Sometimes, the Long Cotton House was used for other purposes. Sometimes a female dog in season would be kept enclosed until the mood passed. It was also where our childhood pet, Pup, spent his last days alive after being run over by Dad backing his car out of the yard on a busy day. Pup had been with us for over 10 years and was a “bird dog” by looks but to us he was a playmate and protector during our childhood. It has been a long time since cotton was king in Oconee County. For a number of years now, farming as we knew it, is “Gone With the Wind”. Later generations have sold farms for land prices that our ancestors would not have imagined to be possible. Change has brought more material prosperity. “Progress” has brought many modern conveniences and a better standard of living. Some of us do miss the sense of community that we enjoyed in the 40’s, 50’s, and 60’s. In those years, we had long-term neighbors – who lived within a couple of miles. We had bonds with family and school class mates that continued for years and for lifetimes.